Recipe for split pea soup – creamy but chunky with texture from vegetables and beans and it’s a hearty meal. Fortified with salty ham, this soup is comforting and filling. For just pennies a serving it’s a delicious meal your family will enjoy! 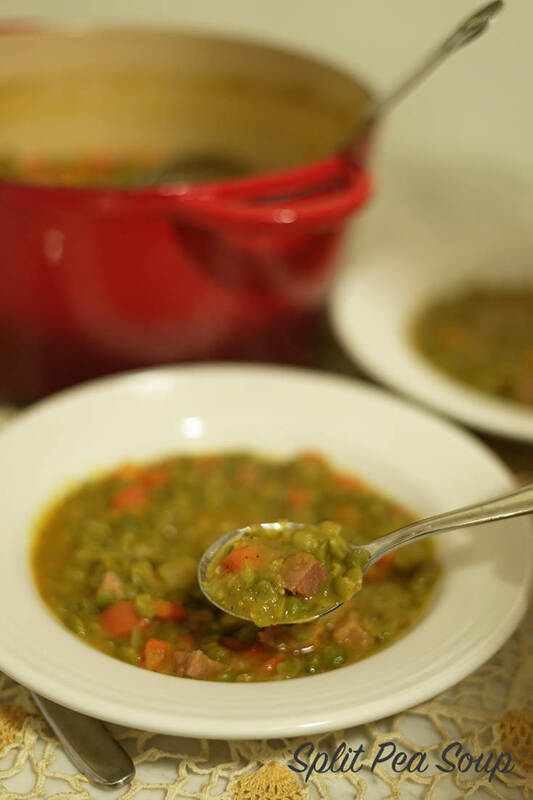 My recipe for Split Pea Soup is an easy meal. Super hearty and very flavorful! Who isn’t a fan of a great Split Pea Soup? So much yummy flavor – hearty and delicious, this is the perfect soup for a cold day and an easy meal in the summertime! This soup is full of vegetables, carrots, onions, celery and yams. Finishing the soup with a handful of parsley and a touch of apple cider vinegar brightens the soup and updates the taste. Grab your spoon for a big healthy serving of split pea soup! It really takes a good 35-40 minutes to cook split peas, but it’s totally worth it! Let me show you how easy this soup is to make. You’ll start by sautéing the vegetables. Here are the next step to make this tasty soup. Simmer for 35-40 minutes until the beans are tender. Stirring the soup often will help break down and dissolve the peas making a creamier soup. You know what I always say, soup is good food! no leftover ham? Buy a ham steak, they are sold individually at the grocery store and the flavor is so good. Perfect for soups & stews! This recipe for split pea soup has so much yummy flavor. 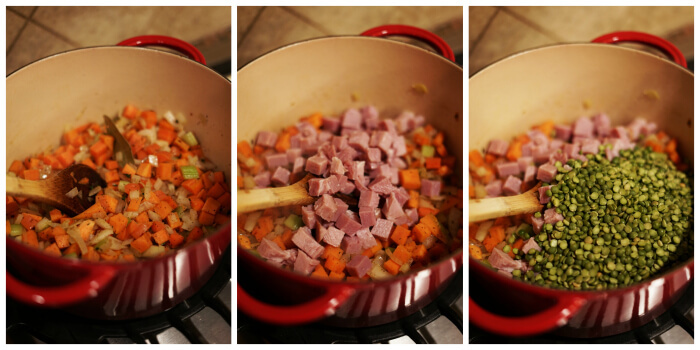 It’s hearty and delicious, full of texture and fortified with salty ham and full of vegetables. It’s a great meal for lunch or dinner! Who isn't a fan of a great Split Pea Soup? So much yummy flavor - hearty and delicious, this is the perfect soup and a great meal! Chop the vegetables. Peel and dice the onion, carrots and the yam. Dice the celery. Mince the garlic and the thyme. Heat a heavy bottom stock pot over medium high heat. When hot, add the olive oil, then the vegetables. Everything except the garlic. Add pepper, red pepper flakes, bay leaf and thyme. Saute over medium heat, stirring occasionally, about 5 minutes. The last 30 seconds of sautéing add the minced garlic. While the vegetables and spices are cooking away, dice the ham into a small dice. Next add the ham to stockpot and stir well. Add the split peas, reserving 1/2 cup. Add the chicken stock and water. Increase the heat to high and bring it to a boil. Reduce to medium and simmer at a low boil for 45-50 minutes (see notes. *) While it is cooking, give it several good vigorous stirs. Simmer uncovered. Taste to adjust seasonings - you may need to add some salt, but chances are good the salt from the ham will be enough. Optional step - when the soup is cooked turn off the heat. Chop a handful of parsley and add it to this soup along with a tablespoon of apple cider vinegar. This addition will brighten the flavors and really enhance this soup! *Reserve 1/2 cup of split peas. After the first 10 minutes of cooking, add the remaining split peas (this step is optional, but I enjoy soup with texture). Simmer an additional 35-40 minutes until the beans are tender. Want to up your soup game? Chop all vegetables into a small dice so each spoonful has all of the delicious ingredients in each bite. If you enjoy this soup, you’ll definitely want to try Ham and Bean Soup. A classic combination of flavors, not only is this soup easy and delicious, it’s an affordable meal too! 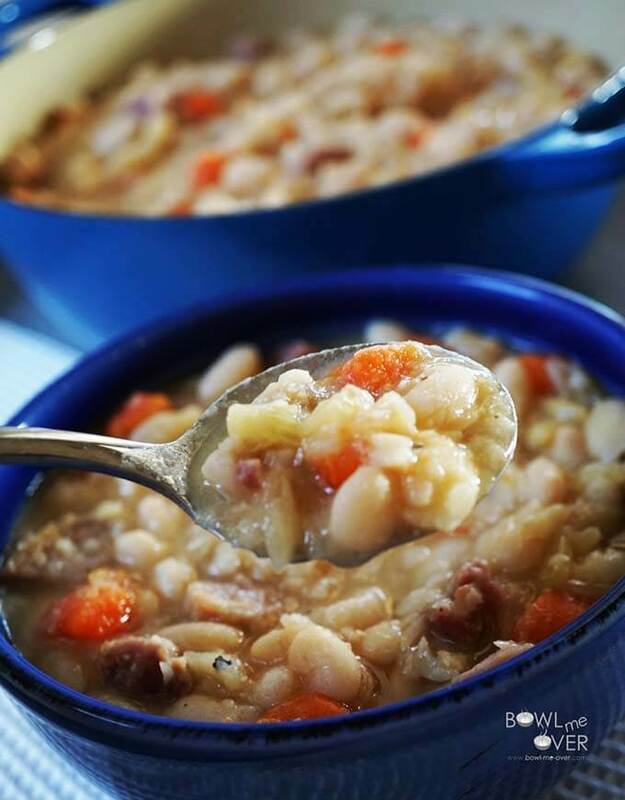 When I say soup is good food – Ham and Bean Soup is one of the best! 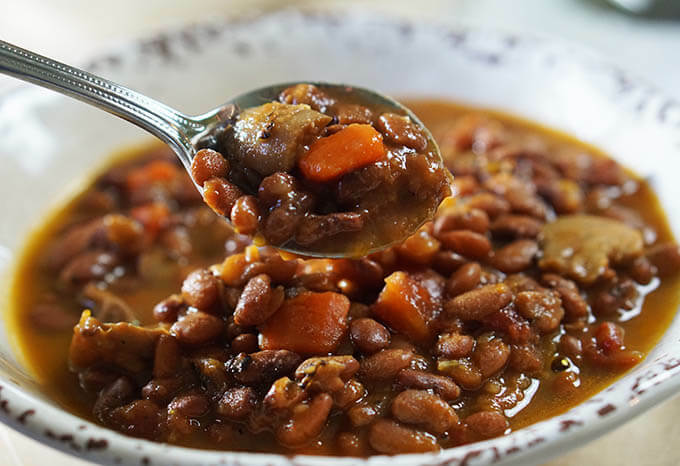 Vegetable Bean Soup – Not much better than a pot of beans slow cooked on the stove – so much flavor and just pennies a serving. Don’t want to spent hours in the kitchen? 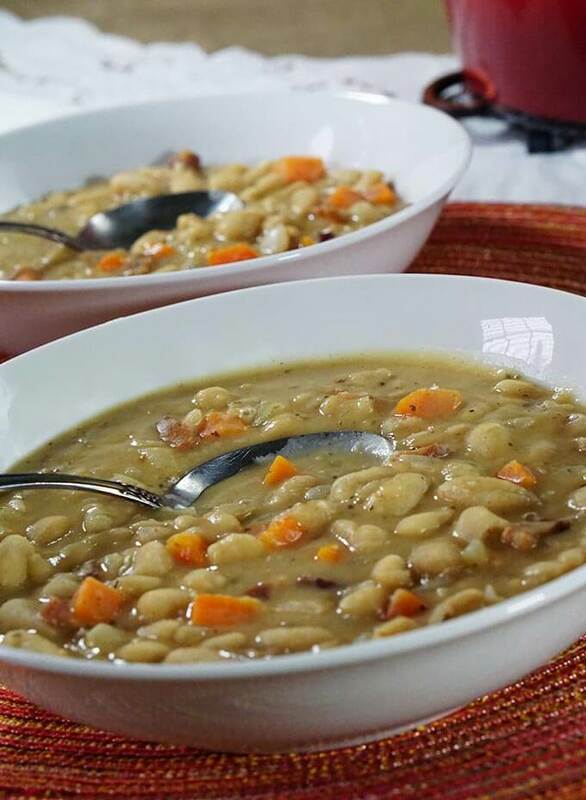 My Bean with Bacon Soup has the slow cooked flavor you love, but it can be made quickly for an easy weeknight meal! Looking for more great recipes for split pea soup? 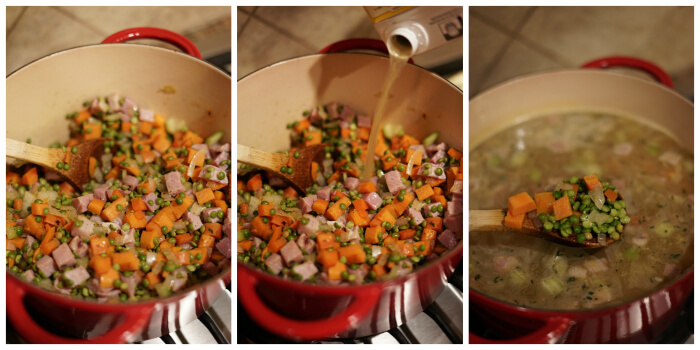 Parker’s Split Pea Soup Recipe from Ina Garten looks so delicious! This slow cooker version from A Sweet Pea Chef looks just luscious. I’m telling you guys, soup is good food! This recipe for split pea soup has so much yummy flavor. It’s hearty and delicious, full of texture and fortified with salty ham and vegetables. It’s a great meal for lunch or dinner! This split pea looks delicious. We love to eat split pea in the winter. Going to put this one on my list. I love the fall Susan when soups are perfect to enjoy! I love this soup, I hope you do too! Yum! My kids and husband love split pea soup but I never make it because my mother in law makes it for them. I might have to start though! This looks delicious! This split pea soup looks perfect! YUM! I’ve never seen split pea soup with yam, but imagine the naturally sweet contrast is wonderful! Yes, it’s a perfect combination Alisa – I hope you give it a try! I would have never thought to add vinegar here – love that! 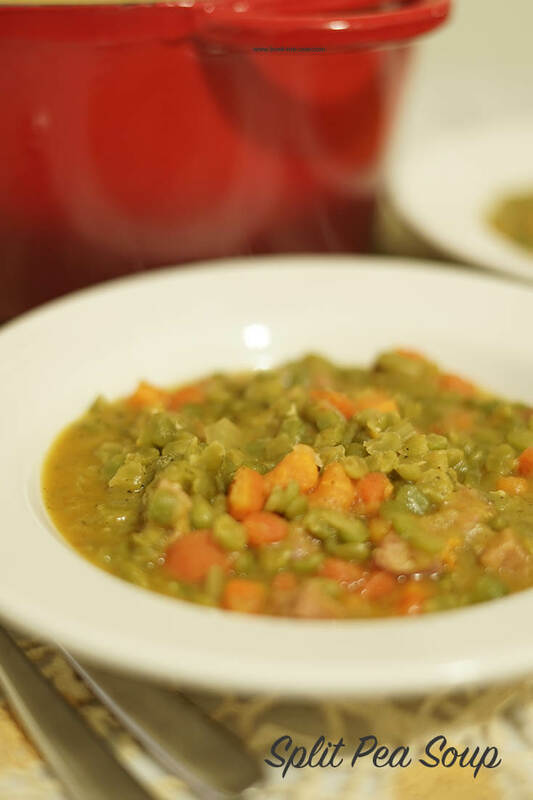 Vinegar really brightens the flavor Ashley – give it a try next time you make Split Pea Soup! Perfect comforting soup for fall! This will surely impress a bunch of guests! I’m a huge fan of split pea soup, this looks wonderful! We really enjoyed it, thanks Joy, I hope you give it a try! I do love split pea soup and your recipe sounds wonderful. I’m intrigued by the addition of yam, I’ll have to add it next time I make this soup. Wonderful – I hope you give it a try Joanie! Thanks so much for joining us for #TryABite Tuesday! Please come join us again over at Prairie Gal Cookin’ for next week’s link-up party! A big bowl of this would warm me right up. It looks perfect. The split pea soup is so perfect for the winter blues. Its looks so appetizing. It’s an old fashioned soup, but so good and such a hearty meal. Thank you Sandi!! Perfect for that leftover holiday ham! Absolutely – make those leftovers new again! I’m not a fan of peas I’m afraid but this sounds warming and perfect for this time of year. My husband is the avid soup eater in this house. He’d love this! I love trying new soups during the winter! I can’t wait to try making this recipe! Wonderful, I know you’ll just love it Carolyn! Split Pea is a classic and so delicious, enjoy! Deb made this for us at Christmas when we were visiting. It was just so good. I recommend this soup. Very very good. Split pea is one of those soups that is so good, but kind of forgotten about! I’m glad you enjoyed it Mom, it’s so delicious! Looks yummy and spicy, perfect for the winter! Most definitely Richa, I hope you give this a try! !